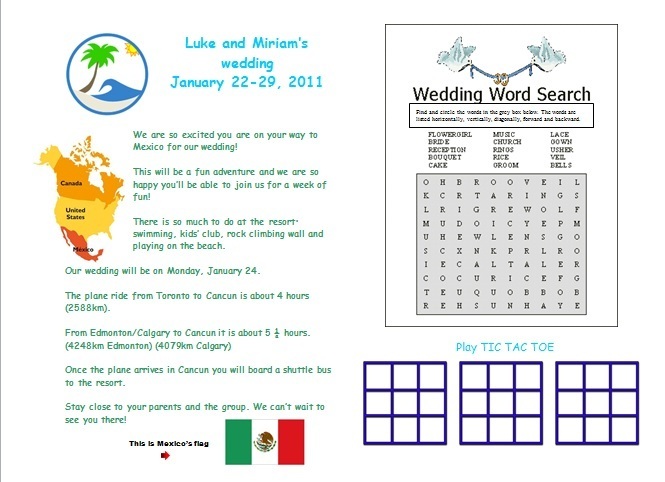 Miriam and Luke were wed on January 24, 2011. 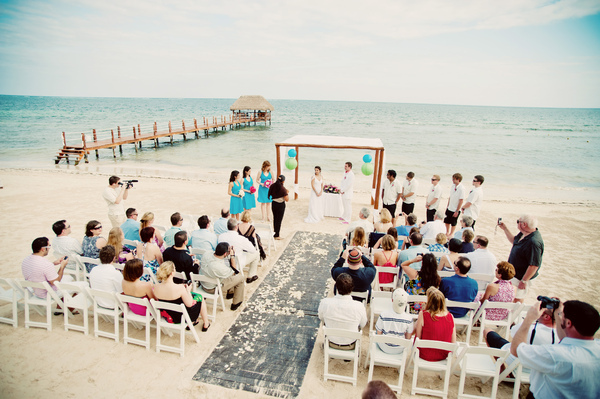 Miriam, username Murmel, used the BDW Community to bring her destination wedding to life. There were quite a few reasons why we choose a destination wedding. The first one was a very personal choice. I lost my father to cancer as a teenager, and my mother is ill and now resides in a nursing home. I feared having a “traditional” wedding would bring a flood of emotions of not being able to have my parents there. So I thought- “Sun, beach, drinks-that would make it a happy and relaxed location for me”! Another huge reason was that almost all of our guests would have had to travel to our wedding no matter where we did it. Our family and friends are so spread out that we figured we might as well all travel! There have been so many weddings that we have travelled to, only to get a minute or two to spend with the bride or groom over the weekend. So since we don’t get see each other often, we though what a great way to spend a week together. My husband and I are blessed that we manage to travel quite often, and we simply love Mexico! So it was an easy choice for us. As well the Cancun airport is such a popular destination it made it easy for our guests to make their way there from all over Canada and the USA. Choosing the actual resort took a lot of time and research. A few of the major wants and needs were: We knew we had guests with kids coming, so a family friendly resort was required. We wanted good food (not just buffets!) Nice rooms, good service and all for a decent price. So after using a number of resources (Trip Advisor, Debbie’s Caribbean, travel agency resort flyers, friends suggestions) we narrowed down our search to 4 resorts. (I only discovered BDW after we had already chosen…and after that it’s history. I used this site to help me with everything else!) We then travelled down to the Mayan Riveria and toured through the resorts. We fell in love with the Sensatori. It was big enough to afford lots of activities, space and privacy-but small enough to make it easy to find each other and create an intimate feel. The staff were friendly and helpful, and the food is the best we have ever experienced in the Caribbean! (We have returned 3 times now because it is such a beautiful resort) The only downfall is the beach, which is small and the water rocky. But we are more pool type people anyway, so it doesn’t affect us to much! Our travel agent was also able to get us a group rate of about $1500 CDN/person for the week. (this included return flight, transfer to/from airport, room and all food/drink) So we were sold! Turquoise and lime green, with some accents of black and white. You’ll also notice some pink and purple-this was a tribute to my mother. When my parents got married she carried pink, purple and white flowers down the aisle. So I wanted to do the same! And my husband loved the idea so much that he carried the pink into his outfit. He had custom made pink Converse sneakers and a custom made shirt with pink collar. I married my best friend that day! What more do I need to say. There were so many special moments that day. My sister walking me down the aisle. Having breakfast with all my girls in the morning. Celebrating with family and friends. Having our guests serenade us during dinner. Heartfelt speeches. Hearing the ocean lap up on the shore, as we said “I do”. The whole week was just such a wonderful, relaxed time with friends and family- I could not have asked for a better experience! Also having 2 “weddings” really made it special for us. Even though we downplayed the legal wedding, it held very special meaning for us. Since my mother is ill, we knew she would be unable to attend our wedding, but we were able to find a wonderful judge who went out of his way to help us, and got married at the nursing home in front of my mother! Your Wedding was absolutely beautiful! Your posts and reviews will be extrememely helpful to our new brides. Thank you for sharing your special day with us at BDW. Miriam- I am getting married at Sensatori January 26, 2013...did you find that it was warm enough to enjoy the pools and ocean while you were there in January?